If I had a penny for every piece of technology fleetingly considered the “future of journalism,” then I suppose I’d have quite a lot of pennies by now, if not quite enough to retire on. Chatbots are one such technology, with CNN, the Wall Street Journal and the Guardian among those launching experimental versions within Facebook Messenger. "It’s an opportunity to create something technical, without having to actually write a line of code." The attractiveness of using messaging apps to get content to readers isn’t hard to work out: they offer the prospect of reaching a large number of people through popular platforms such as Messenger and WhatsApp, they have a high clickthrough rate, and they include less of the unpredictability associated with the algorithms that surface content on Facebook’s News Feed, Twitter and Instagram. Then there’s the growing presence in our homes of voice-activated tools such as Amazon Echo. Becoming the news brand that we ask Alexa for has the potential to be a goal worth fighting over for newspapers, digital publishers and broadcasters alike. 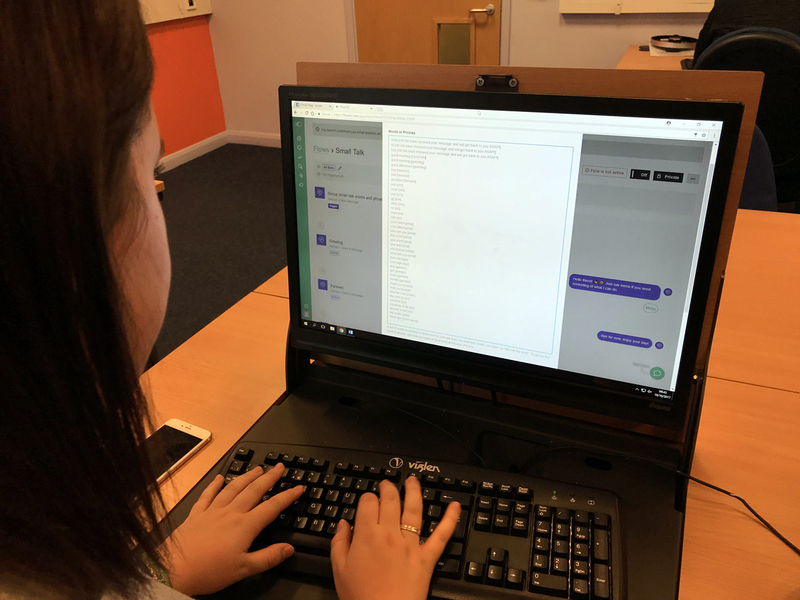 Happily for journalism educators, free tools to help your students learn about how to create simple chatbots are at hand, so they can at least get a taste of the developing trend, as my students recently did during a standalone chatbot experience. The goal of the two-hour-long session wasn’t to get students to suddenly create the new market-leading product, but simply to play with the technology and have something they could show off to their friends at the end. With students in the final year of their degree (we do three years here, not four) and in the midst of compulsory internships, I also wanted to offer them the opportunity to learn another cutting-edge skill they could take to their employers. The students who pass through my classes tend to have little or no experience of coding (I anticipate this will change in the future), so in addition, it’s an opportunity to create something technical, without having to actually write a line of code. Flow XO generally creates bots used by businesses to handle basic aspects of customer service. It’s in this field that some students had come across chatbots before, which meant at least a few members of the classes were slightly familiar with the concept. For the sessions, I prepared a help sheet in advance, guiding the students through setting up an account and adding some of the pre-set commands and responses that Flow XO allows in an off-the-shelf fashion. The only thing students needed to set up was a Facebook Page, as if for a business. Many of the pre-sets within the software betray Flow XO’s wide range of clients, with templates including buying tickets and booking restaurant tables. The “small talk” option is what students worked with mainly, as it allows them to develop responses to a range of possible queries. If you tell Flow XO to look for a certain keyword, you can tailor the response it will give when it sees it. The debugging process was what took the most time. This was, in part, because Flow XO would occasionally serve an error message, but more often, it was because of a missing or misplaced piece of punctuation somewhere within the editing area. Even with no “proper” coding, working out where you’ve gone wrong can be frustrating. I had relatively large classes for these sessions – 15 or so students in each, including some from various countries for whom English isn’t their first language – and this probably presented the biggest challenge. Spending even a couple of minutes helping one student find the small error in his or her work can mean neglecting the group as a whole. Even with a help sheet to work through, some students didn’t have the patience to go through everything with a keen eye and spot errors. This last issue is probably a function of my instruction: I needed to make sure students were familiar enough with the concept, as well as the “why” behind it. I set it up as a fun, stand-alone session to learn a new skill, but if students can’t see how it would directly feed into an assessed piece or something like that, it can be tricky to keep everyone enthused and on task, even over a two-hour period. The Beginning of Something New? I imagine this will be easier in the future as chatbots become more commonplace. News companies have developed much more sophisticated versions, usually defaulting to a range of the day’s headlines before producing the latest content about any topic for which you care to enter a keyword. Perhaps most notably, Quartz brings the conversational style of a messaging service to its bespoke app, and that’s probably the closest anyone has come to a genuinely satisfying journalism experience with this sort of technology. I still wouldn’t call it anything like the “future of journalism,” and I’m not sure it’s yet worth devoting weeks of class time getting students to try to match Quartz or anyone else. There are technical skills which have a more obvious journalism utility in the short-term. But it’s well worth keeping an eye on how this mini-sector continues to develop. Richard Jones is a senior lecturer in journalism at the University of Huddersfield, where he mostly teaches online and social media skills to student journalists. Before becoming an academic, Richard worked as a journalist for a variety of British news organizations including Sky News and the BBC. He was a fellow at the 2017 Scripps Howard Journalism Entrepreneurship Institute, held at the Cronkite School at ASU, and blogs at richardjonesjournalist.com.